I was looking forward to this. Professor Glyn Parry of the University of Wellington, New Zealand, doesn't just know his stuff, he's also an excellent speaker. 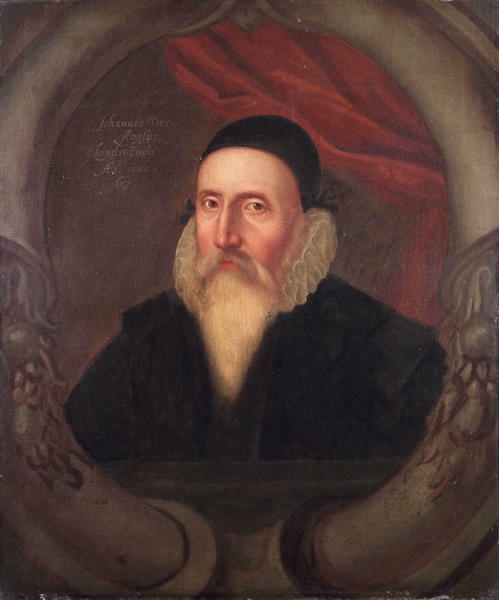 This was Parry's second visit to the John Dee of Mortlake Society, on a trip to the UK, which also included Atlantis Bookshop's John Dee Day and time for research for his forthcoming book on Elizabethan magic. Although Dee travelled widely, the lecture concentrated on his activities at his home in Mortlake. Dee's mother bought a modest house in Mortlake in the 1560s. Later, Dee himself acquired the property next door and set about the practice of Paracelsian medicine. He offered accommodation to visiting scholars who came to consult his library and at one point suggested setting up a school of magic for aristocratic orphans. He also acquired royal patronage by drawing up favourable horoscopes for Elizabeth I. By 1583 Dee had lost favour at court and travelled to Europe with his associate Edward Kelley. The popular story that he returned to find his library ransacked is untrue. Dee mortgaged his house to his brother-in-law before he left and it was he who sold Dee's most valuable books and equipment. Dee returned to England in the 1590s and spent some time as Warden of Manchester Cathedral. He returned to Mortlake in 1605 after the death of his wife and some of his children. Dee was 77 then, but began making plans to move to Germany and become professor of alchemy at the University of Marburg. Sadly, he was too unwell to make the trip and died in 1609. He is buried under the chancel of the church of St Mary the Virgin, where this lecture took place. The template I use is one of the standard Blogger templates. I customised it a little by adding my own mast image of the photograph of the moon in the trees with my own text.